Combining old-school cool with modern practicality, this cordless Bosch Country 2 kettle has a striking mint green colour scheme that would add a touch of retro chic to any kitchen. This handy appliance has a sleek ergonomic handle and is equipped with automatic switch-off technology for hassle-free, eco-friendly operation. Holding up to 1.7 litres, its concealed heating element and innovative filter system offer effective protection against limescale build-up, making it ideal for everyday use. 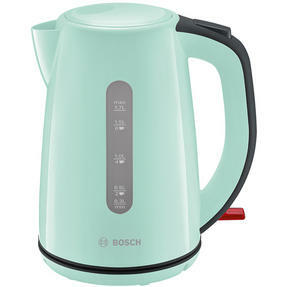 Featuring a retro mint green finish, this stylish Bosch kettle is equipped with a locking lid for added protection during operation. The kettle has a concealed heating element that contributes to a sleek, minimalist aesthetic whilst reducing limescale build-up. Perfect for everyday use, the generous 1.7 litre unit has a removable limescale filter to ensure your water tastes fresh every time. Simple and user-friendly, the kettle automatically switches off when the water has finished boiling, or when lifted from its base. This lightweight and highly functional appliance boasts a cordless design that allows for easy transportation around the kitchen.